- Create and send me debug log. The problem is that neither Windows Media Player nor VLC can play the sound of the splitted files. But my smart TV can play the sound of these files. Tell me what steps information to add that is not in the attached logg file. - What format of video file do you use? - then run processing again. After problem occurs close HandySaw, find debug log file(it will be in "C:\Users\USERNAME\Documents\Davis Software\HandySaw DS" folder) and send me. 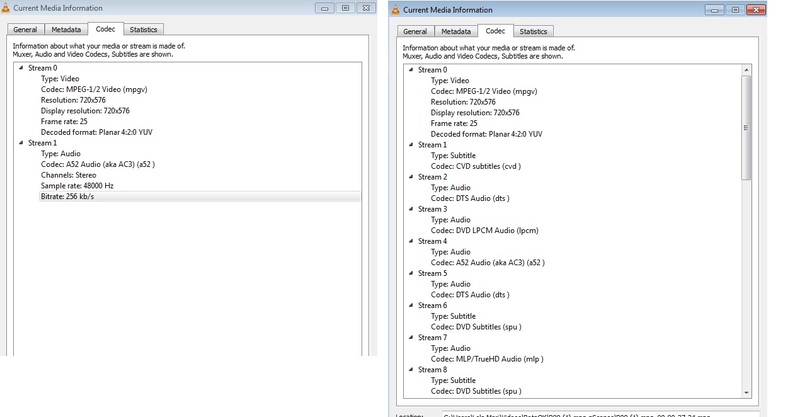 VLC reports diferent audio codecs for thee Original file and for Clipped file. You can see it in attached file. Did you set up plug-in's variables? Did you install ffmpeg software? Then run HandySaw DS, press Preferences button, go to Plug-uns tab and setup ffmpeg.Cutter.js plug-in. After this you'll ready to use plug-in. Pressing OK takes me back to the HandySaw interface with the first scene filesize being 5,160 KB and in an unusable format. Source file is about 12.5 GB. I have several DV 1 files . Some of them splitted fine, other - without audio. There are no bugs in HandySaw. Im running a DEMO copy of HandySaw DS 4.1 on a Vista machine. I have captured a 60 minute DV tape to a single AVI file via the Vista DV capture utility. The single file has video and audio intact in a single file. I have configured HandySaw to create a subfolder for the scene files and to use the 'Split' Result Type. I am also asking HS to append a datecode to the filename of the split scene files in the sub directory. When the process is completed the files are all there (the first 15 anyway, due to the DEMO) but all of the files have lost audio. Video still looks good. Any help to get my audio back?